Future generations will no doubt wonder at our response, given the scale of the threat. It’s known that death, poverty and suffering await millions, and yet governments still vacillate. But solutions are available. Here are ten reasons to be hopeful that humans will rise to the challenge of climate change. Any politician who runs as the personification of hope is bound to be a bit of a let down. And so it seemed for five long, hot years. Barack Obama inaugurated his first US presidential term by promising to “roll back the spectre of a warming planet”. Yet he seemed unable (or willing) to even roll back the ghosts haunting his Congress. Now, as he staggers into his legacy-building stage, Obama has confronted and even circumvented Congress. His emissions caps on coal power stations, announced last month were the culmination of a massive public relations push and scientific blitzkrieg with Obama as its champion, potentially making the next presidential election a referendum on climate change action. Just a day after the launch of Obama’s big crackdown on coal, He Jiankun, a top Chinese government climate advisor told Reuters, “The government will use two ways to control CO2 emissions in the next five-year plan, by intensity and an absolute cap”. This was the first time the promise of limiting absolute emissions had emerged from a source close to the Chinese leadership (even if He was later forced to disown the comments). The response of world’s largest emitter of carbon has the potential to be swift and decisive, given its centrally controlled economy. Responding to smog-tired residents in China’s cities, the government has ordered a mass shutdown of coal plants within a few years. Coal control measures now exist in 12 of the country’s 34 provinces. Greenpeacehave estimated that if these measures are implemented, it could bring China’s emissions close to the level the International Energy Agency says are needed to avoid more than 2C warming. According to the authoritative IEA thinktank, the price of installing photovoltaic (solar electricity) systems dropped by two thirds over the past six years. The resulting solar explosion has generated a “prosumer” market, in which the owners of homes and businesses are taking ownership of a growing proportion of the energy supply. During June in Australia’s “sunshine state” of Queensland the price of electricity fell below zero for several days, largely thanks to the input from privately-owned solar panels. The UK, Germany and other European nations smashed their record solar outputs over this year’s summer solstice. The UN says global warming will impact more women than men because they make up the majority of the world’s poor. Close to two billion people rely on wood, charcoal and agricultural waste for cooking and heating. The primary gatherers of this toxic, labour- and carbon-intensive energy source are women. Thus, the education and social emancipation of women could be one of the greatest catalysts for grassroots climate action. Bangladeshi women who previously lived without electricity have been retraining as solar technicians to bring power to the country’s 95 million people who live without electric light. The country now has the fastest growing solar sector in the world with 2 million households fitted with solar power units. Falling technology prices, innovation and some decent government initiatives have seen renewables taking an increasing share of global electricity generation. After stalling through the early part of last decade, the increase is now inexorable. The sector, flushed with confidence, has begun to attract the kind of sustained investment growth of which most industries can only dream. In 2013 investors contributed US$268.2 billion to renewable projects – 5 times more than in 2004. The average growth of US$24 billion per year is in the same ball park as the riotous expansion of venture capital during the late 90s dot com bubble, except it has already lasted five time longer. Bloomberg New Energy Finance estimates that by 2030 spending on renewable energy sources could make up two thirds of a global energy spend of US$7.7 trillion. In every part of the world (barring the Middle East) governments are taking advantage of the cheapest way to bring down their emissions – by saving energy. Energy efficient housing and appliances have seen global household emissions drop almost 1% per year, which doesn’t sound like a lot, but a 1% drop over a year is equivalent to every resident of New York going completely off grid. In the EU, households reduced their consumption by 15.5% between 2000 and 2011. In the developing world, where urban populations are booming and millions of new homes will need to be built, the IPCC has said there is a “window of opportunity” to create sustainable housing for the future. Since 2009, the United Nations’ Sushi programme has been training local builders and planners in Thailand, Brazil, India and Bangladesh to use low cost energy efficient building practices for social housing projects. A recent WWF/Ceres report found that the 53 US Fortune 100 companies who report their emissions had cut their carbon footprint by 58 million megatonnes in 2012 – roughly equivalent to the total emissions of Peru. This was achieved mainly through energy efficiency measures, although switching to green energy sources was also a factor. These measures are turning out to be not just cost effective but actually a business imperative. Each megatonne reduction saved an average of US$19 – a total of US$1.1 billion across just 53 companies. In the UK, tyre manufacturer Michelin has dropped its £20 million energy bill by 20% in five years by employing energy managers. “[Climate] adaptation is just good business,” say analysts from PricewaterhouseCoopers. Oil and gas companies are finding it increasingly expensive to find and extract their buried gravy. The Wall Street Journal reported in January the total capital expenditure of fossil giants Chevron, Exxon Mobil and Royal Dutch Shell grew to £70 billion in 2013, yet all three have experienced huge declines in production relative to cost as their budgets are stretched by the need to open new wells in challenging environments. Off the coast of Brazil, huge oil fields lie more than 5km beneath the deep ocean floor. Despite the world’s largest corporate spending programme (£138 bn), national driller Petrobras is being driven towards the wall by the crippling expense of drilling so deep. Since 2011 electric car sales have doubled every year. Consumer acceptance of the technology is on an exponential growth curve that researchers say will see more than one million such vehicles driven across the world by the end of 2015. Five years ago, the technology was a quirky, futuristic gimmick lacking any serious impact on the global car market. Questions were raised about its price competitiveness. But in Norway, one in every hundred cars is now electric. Beyond the oft-enlightened Norse, the technology has a growing foothold in the US (which is by far the largest single market with 174,000 cars), Japan (68,000) and China (45,000). 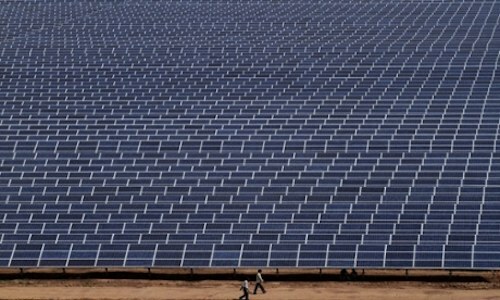 Image: Indian workers walk past solar panels at the 200 megawatts Gujarat Solar Park at Charanka in Patan district, India, Saturday, April 14, 2012. Photograph: Ajit Solanki/AP guardian.co.uk © Guardian News & Media Limited 2010 Published via the Guardian News Feed plugin for WordPress. The remaining “believers” would have us believe that the scientific method prevents science from actually “saying” they are more than “95%” certain or say “proven” or “eventual” or “inevitable” even though it’s about saving the entire planet from a global climate crisis possibly caused by Human CO2. That’s why it’s called “belief”. History will call it exaggeration but generations of children will call it fear mongering. *Canada killed Y2Kyoto 2 years ago with a freely elected climate change denying prime minister and nobody cared, especially the millions of scientists warning us of unstoppable warming (a comet hit). And what did YOU do about it planet lovers? Right, science is never 100% certain of anything. That’s not how science works. Now, how certain are you there won’t be a crisis? If we haven’t set the world on a course toward total polar meltdown, 75 meters of sea level rise, the drowning of the homes of billions of people, and untold climate chaos just with the CO₂ we’ve already emitted, why isn’t there a single previous example in Earth’s history of polar ice caps withstanding CO₂ so high? Now CB…calm down. You and your Chicken Little scare tactics. Can you decide on one position or the other? Can’t be both now…or can it, i.e., for CAGW fanatics. But it is FUN to watch you make this stuff up. Yep; the sick stalker S. Graves replies to CB once again with the same silly crap and childish spit wad tossing style comments. Do you mean I responded to her very same post with the very same response? Funny, Stoner. After all, her obsessively repeated nonsense about ice caps is always the same and, therefore, the answer is the same. Get it? I know it’s tough for you Stoner. You have just demonstrated elsewhere that she is wrong about her ice cap nonsense…so we are now on the same side. You should respond to her next time she posts her BS and let her know what you have found about a mechanism that demonstrates her to be wrong. The very important difference is that CB is replying to (*many different*) GW deniers on many different websites. So her comments may be very similar with her replies as they are correct and give a person something to think about. You on the other hand follow her all around the web and reply to her on almost every comment she posts. with near the same attacking comments with full support of the ignorant GW deniers…..She isn’t doing that to just one person, you are. You are a crazy stalker and it is clearly obvious. You have decided to be a watchdog and attempt to show other GW deniers that CB is not credible. She is however, she is very credible, honest and displays a high degree of decency, sobriety and common sense. .
Yes…with the same inane BS. She also follows me and likes the posts of those who challenge me…or those who are just dunces and try to be relevant…like you. Oh…look…she liked this very post from you. If she’s so credible, why have you now demonstrated that her ice cap nonsense in incorrect, as has Sky Hamster? As I have recently explained to you, you do not comprehend what is written… Where have I disagreed with CB’s comments about ice caps? Another thing is if I, or CB, or others may be incorrect about something, it should not destroy their credibility. Of course if you never have erred, you would disagree. You provided a mechanism by which ice caps formed with CO2 well above today’s levels; “They formed then because the atmosphere was so think with volcanic ash and dust which lasted for hundreds of years. That blocked the sunlight and ice quickly formed, primarily and more so at the polar regions..
Now you can rationalize all you want but one or the other is incorrect. Note the certainty of her first quote. That’s not a error. Sky Hunter says she’s wrong. Why is it a big deal? Ask her. She’s the one who posts it board after board. Must be important…right? Oh…yeah…then there’s this. Do you get ANYTHING right? You have a new follower on Disqus. Solution: Obama just opens the East Coast up for drilling oil. I am not surprised she decided to follow you. One is wise to know their clear and obvious enemy, especially one who stalks them. You totally do not understand the reason for CBs two seemingly conflicting comments, she probably wants to see what the person does know about the history of our atmosphere. So she asks that question of some. Why don’t you ask her in a decent, civil manner? Or are the words decent and civil beyond your comprehension? Then when someone answers correctly…like you did…she should acknowledge it. And if someone asks for her science, she should provide it. But she can’t. Let’s hope that’s not the case. We can’t give up hope just yet.